Maki mi soup is one of my favorite Chinese food and I remember when I was still in highschool this is always served in a small fastfood (Ha Yuan) near our school. I think this is one of the most tastiest soup served in some panciterias in Binondo. Ha Yuan had a branch in Megamall years ago but it disappeared so I was very disappointed because it was kind of a comfort food to me. But they have other branches in Makati and Quezon city. 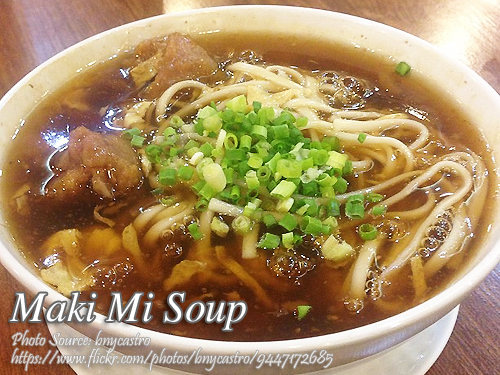 Maki mi is composed of fluffy tender slices of pork cooked in a very thick brown broth and mixed with beaten eggs. Then poured over on cooked egg noodles or mami. And about that thick gooey soup, I think there is no substitute for using sweet potato starch because I’ve tried cornstarch and cassava starch and the result is not satisfying. Always remember this ratio when making the soup, 1:1:1 which is 1 tablespoon starch, 1 tablespoon water for making the slurry and 1 cup of soup stock or broth for a very thick soup and for making it a little thinner, add 1 to 2 cups broth or adjust the amount of starch. For example instead using 6 tablespoons of starch, use only 4 tablespoons. Hello, can you please make a video on how to cook Maki Mi. Also where can I buy these ingredients such as sweet potato starch. Maki Mi is also my favorite dish, there is no asian restaurants here in the USA that makes them. Thank you. I’ll make a video soon. I think potato starch is available in big supermarkets there in the U.S. If you can’t really find it in your area, you can order online. You can try amazon.com. You can buy the ingredients in supermarkets. Instead of sweet potato starch you may also use corn starch as substitute same measurement will do. Hi Jerson, yes cornstarch is the ideal substitute and also cassava starch, but the sweet potato starch is really different in consistency and has a unique sticky and gooey properties. Thank you for your generous for giving out your recipe. Hi Aida, I’m happy that you like the recipe. Me and my classmates would take a jeep from Recto to Magdalena just to eat Ha Yuan’s Maki Mi and Camto Mi. It’s as if I could still taste it…thanks for the recipe…now I won’t really miss it that much, everytime I cook it. Could you post Ha Yuan’s Camto Mi and fresh lumpia recipes please. Hi Cecilia, thanks for dropping by. Actually Camto Mi and fresh lumpia is my favorite when eating in Ha Yuan’s, maki mi is only secondary 🙂 I love the curry flavor and aroma of camto mi. I hope I could find the camto mi imitation recipe and fresh lumpia from Ha Yuan’s so I could post it here. Hi Lydia, thanks also for sharing your comment. I hope you will like the dish when you cook it using this recipe. Hi Christine, yes you are right Ha Yuan is the maki mi place and I think they are the pioneer in serving maki mi. Hi Stella, thanks also for visiting and your comment! Hi. I made this for dinner tonight. It was a total hit. I wasn’t able to get the ‘blackish’ color since it came out kinda lighter in shade, but my, they adored my cooking. I used tapioca starch instead of the sweet potato one since I cannot find them in the supermarket. I doubled the amount tho since I like my soup really gooey. Thank you for the recipe. Will try the gourmet tuyo next. Hi Anne Marie, thanks for sharing your experience in cooking this dish. And about the color of the maki mi, I think adding more soy sauce will give you a darker shade.